IC2 produces software and websites and also special apps, like Windows 10 Universal Apps. With PhotOrganize you can organize a photo collection such that the subjects of the photos are always recognizable and a selection of photos is easy presentable. See the product page for details. You can obtain your copy for Windows 10 from the Microsoft Store . We also developed the App 365xDuurzaam. 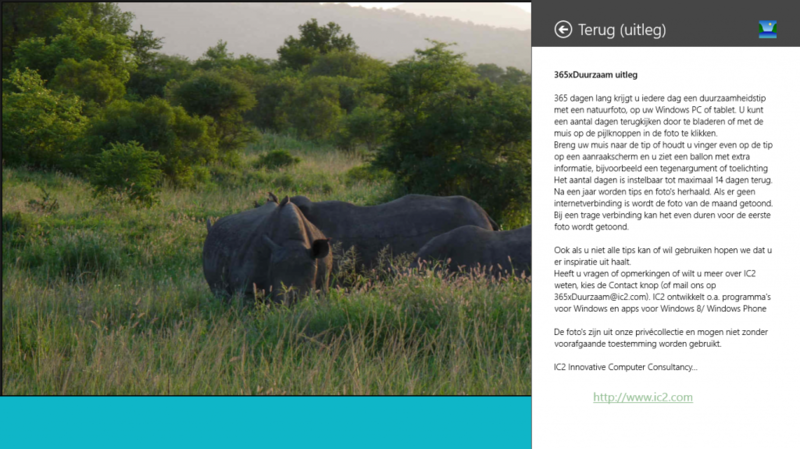 For 365 days you see a new tip for sustainability (in Dutch) and a nature image we made on your Windows 8 PC or tablet. You can download the app for free via the Microsoft Store . This will work on all applicable Windows 10 devices (also Windows Phones). There’s still a Windows 8 version in the Windows Store. If you don’t have Windows you can see the tips and images on the website www.365xduurzaam.nl.